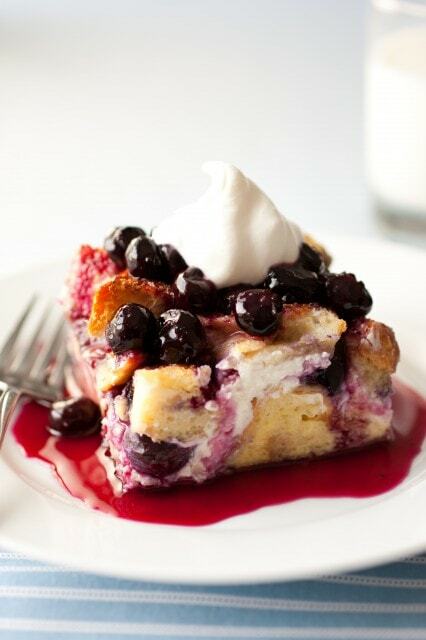 French toast is dotted with blueberries, cream cheese then soaked overnight in a custard mixture and baked the next morning. The perfect weekend breakfast! Here’s the the kind of breakfast that will have you ecstatically jumping out of bed, dancing in your jams and excited to start a fresh new day. Okay, well maybe not that intense (but it would be fun, just one day to start the day like that right =), but when you know this Overnight Blueberry French Toast is just soaking in the fridge just waiting to be baked in the oven, it’s not likely it will be one of those mornings where you cant stop hitting the snooze button. 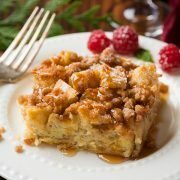 This french toast is incredible to say the least! Cream cheese/Neufchatel cheese and blueberries just go together don’t they (like a fresh baked blueberry bagel covered with a generous layer of whipped cream cheese, mmmm)? 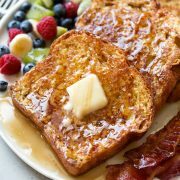 I love berries in my breakfast foods and they are one of my favorite additions to add to french toast. Not only are they packed with nutrition, but they add instant beauty and bold, natural color to a drab looking meal. They bring so much fresh flavor to any dish. With this french toast you get a creamy sweetness, along with slight tang in every bite from the Neufchatel cheese, as well as a perfectly soft and moist, egg soaked french bread, which is layered with blueberries both inside and out. I added lemon zest and juice to the recipe because lemon and blueberry are simply the perfect pair. The lemon just bring the blueberry flavor to life and balances out the sweetness. It doesn’t leave any room for a bland labeling. The use of Neufchatel cheese wasn’t an attempt to make this dish low fat, rather I chose Neufchatel cheese because it has lighter, more spreadable consistency than cream cheese. The lower amount of calories and fat it contains vs. cream cheese is a definite bonus though. Enjoy! Cut 1/2-inch off both ends of bread and discard (or eat). Cut loaf into 1-inch slices then cut each slice into 1-inch cubes (I cut the loaf in half first then kept the cubes from each half separate so it would be easier to determine half). Spread half of the bread cubes into an even layer in a buttered 13 by 9-inch baking dish, set aside remaining bread cubes. In a small bowl, using an electric hand mixer, blend together Nuefchatel cheese, powdered sugar and 1/2 tsp vanilla. In a separate bowl stir together lemon zest and 1 Tbsp sugar. Using a rubber spatula and a clean fingertip, spread Nuefchatel cheese mixture over bread cube layer in baking dish. 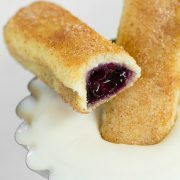 Sprinkle blueberries over Nuefchatel cheese layer then sprinkle lemon zest mixture evenly over blueberry layer. Spread remaining bread cubes into an even layer over top of blueberries. In a blender, blend together eggs, milk, remaining 1/4 cup sugar and remaining 1 tsp vanilla on low speed until well blended, about 10 seconds. Slowly pour mixture evenly over top of bread cubes in baking dish. Cover with plastic wrap and refrigerate 8 hours or overnight. The following morning, remove baking dish from refrigerator and allow to rest at room temperature for 30 minutes. Preheat oven to 350 degrees during the last 10 minutes of resting. Remove plastic wrap. Cover baking dish with aluminium foil and bake in preheated oven 30 minutes, then remove foil and continue to bake 25 - 35 minutes, until golden brown (if it is becoming too golden brown but isn't cooked through then you can cover with foil again during the last few minutes of baking). Allow to rest 5 minutes, then cut into servings and serve warm topped with blueberry syrup and sweetened whipped cream if desired. *Regular cream cheese would also work, but I'd recommend likely thinning out the cream cheese mixture with 1 to 2 Tbsp milk to make it a more spreadable consistency. **After zesting lemon, reserve it in a Ziploc bag to juice the following morning for use in the blueberry syrup. In a medium saucepan, whisk together granulated sugar and cornstarch. Stir in cold water and lemon juice. Mix in blueberries. Bring mixture to a boil over medium-high heat, stirring constantly. Once mixture reaches a boil, reduce heat slightly and allow to gently boil for 2 - 3 minutes until thickened and blueberries have burst, while stirring constantly. Allow to cool slightly before serving. Britt: This was too runny for me. I felt like it didn’t cook thoroughly. I baked it for like an extra 20 minutes and it still was runny. Maybe bc I used frozen blueberries.